I haven’t posted much recently as there hasn’t been much purchasing or discovery of new collectables relating to the Millennium Falcon (although the Hero Complex Gallery recently posted that they might have something of interest in the coming days). Anyway, i thought i’d post a couple of recent tee shirt designs from Red Bubble to keep the blog ticking over. 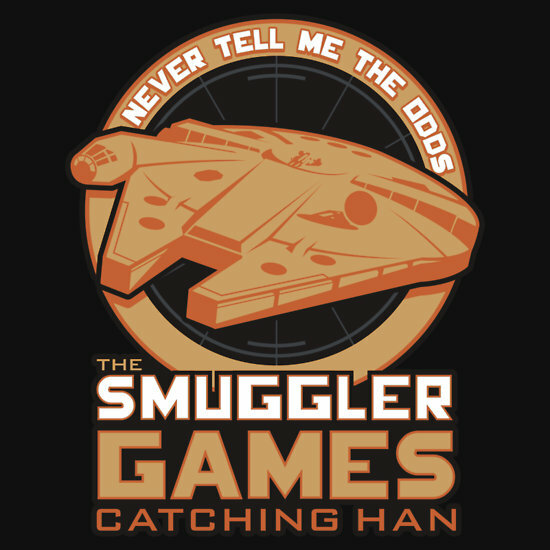 The first is “Smuggler Games; Catching Han” by Ryan Astle which is, or course a play on the recent Hunger Games movie, Catching Fire. I like this design, but i may have to pass as shipping on these is always so expensive to the UK. Either that, or i may look at ordering a few tee’s to bring the postage cost down. This entry was posted in Art, Tee Shirts, Things that i don't have yet... and tagged Art, Millenium Falcon, Millennium Falcon, Ryan Astle, Smuggler Games, Star Wars. Bookmark the permalink.